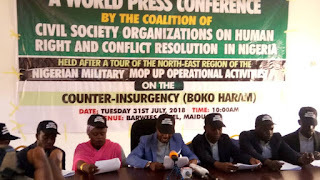 A group of 12 Civil Society in Nigeria under the auspices of the Coalition of Civil Society Organisations on Human Rights and Conflict Resolution in Nigeria has appraised the military’s efforts against terrorism as a journey on course. The group at a world press conference today at Maiduguri after a tour of the north- east said despite frantic efforts by the terrorists to regroup around the borders to carry out attacks on the troops, the military still remain committed and well coordinated to sustain its winning spirit and determination to stamp out terrorism from Nigerian soil. 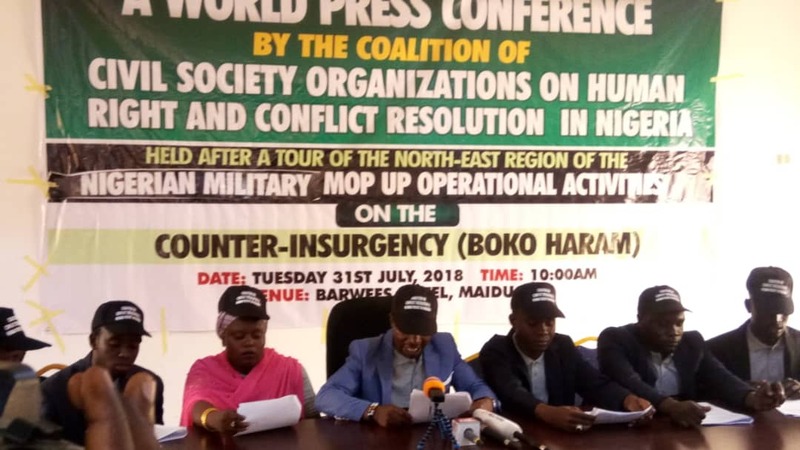 The coalition said after undertaking a tour of the North East in the areas where the military is currently carrying out operations to mop up the remnants of Boko Haram terrorists group, it observed that the troops deserve some accolades. It said in the course of the tour, the representatives interacted with the Nigeria Army, the Civilian Joint Task Force members, indigenes, traditional rulers, officials of the government of the affected states, and other critical stakeholders on the ground. Members of the group observed the areas of operation first hand and compared the reality on ground with images, videos and reports carried in the mainstream, online and new media. Maxwelll Gowon Esq , Executive Director of the coalition while addressing the press, said the population in the areas of operation commended the military particularly the Nigerian Army for not only defeating Boko Haram in their communities but for putting up concerted efforts to ensure that the terrorists are not able to regroup and returning to making life difficult for civilians. According to him, “Despite this high level of successes that the Army has achieved so far, troops have not relented on being on the trail of the terrorists who now operate majorly from outside the territory of the Federal Republic of Nigeria. They do more from the fringes (international borders) from where they launch attacks and flee into jurisdictions beyond the remit of the Nigerian Army. This pattern has enabled remnants of Boko Haram fighters to carry out attack and run into safety. “The terrorists have ramped up the exploitation of filial and communal links to obtain intelligence on troops’ movement, which they then capitalize on to launch attacks. The recent attempt to ambush a military convoy fits this pattern. This highlights the need to rule out connivance between the civilians within the general area of operations and the terrorists. “There is a failure of the state and local government to marshal the needed political will to rebuild affected areas. This has contributed in large part to the ease with which Boko Haram is able to recruit members of such communities. In instances where the displaced persons from such communities are yet to return, the abandoned spaces provide safe havens for terrorists that able to pose as villagers to evade identification. The group recommended Nigeria should extract a stronger commitment from neigbouring countries to support the war against terrorism so that terrorists would stop attacking the country from across the boarders and from within these neighbouring nations. These countries- Niger, Chad and Cameroon should reassure Nigeria they are not behind the terrorists by returning the corpses of terrorists that flee into their territory. Gowon added, “There should be an engagement of people living in the affected areas, including awareness campaigns, to impress on them the need to obstruct any form of support for terrorists since this is not in the interest of anyone. “Department of State Services (DSS) and National Intelligence Agency (NIA) should expand their strategic surveillance for on the spot intelligence gathering across the North East and Nigeria’s neighbouring countries. “The Nigerian Police Force should reorganize and repurpose its Federal Special Anti-Robbery Squad (FSARS) and Mobile Force units to take over civil policing in towns and villages in the North East. “The leadership of all local governments areas council in the North East, especially Borno State, must be fully re-established to begin implementing the mandates of that tier of government as a means of filling the vacuum that presently exists in these areas.